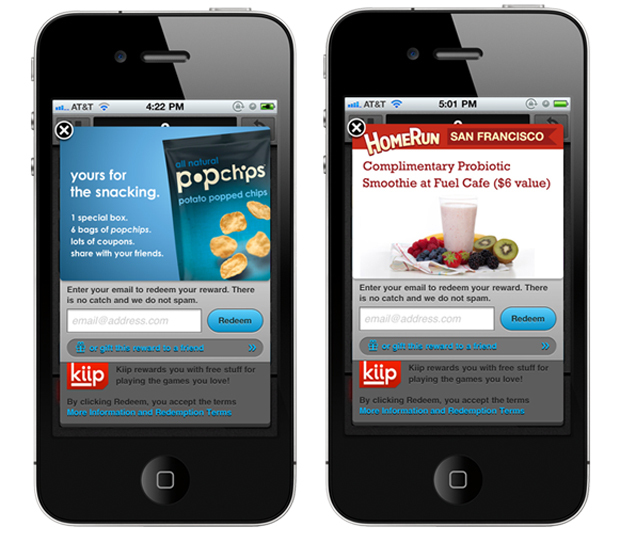 Kiip, a new start-up coming out of stealth mode this week, believes users don’t need another mobile ad. What they want are real-life rewards that recognize their engagement. That’s the premise behind the company, which is looking to upend the mobile ad model by offering users tangible rewards, offers and discounts when they hit in-game milestones or earn difficult achievements. The idea is that advertisers can better reach a consumer with timely rewards that come at positive moments. By tying an offer to that natural pause in a game, advertisers can build better engagement and loyalty than if they utilized a more traditional, persistent display ad, which can often be distracting or intrusive when they’re not ignored outright. This is how it will work: If a gamer passes an especially hard level or completes a big achievement, Kiip can push out a notification for an earned reward. Users then need to enter an e-mail address to redeem the reward. Kiip, which promises not to spam users, has lined up companies such as Sony Dash (s sne), Sephora, Dr. Pepper (s dps), popchips, Homerun.com, Vitamin Water (s ko), 1-800-Flowers (s flws), GNC (s gnc) and Carl’s Jr (s ckr) as customers, who will provide the rewards to users. Kiip will tailor the rewards to the user so they’re relevant and demographically appropriate. This is a simple but potentially effective idea, something that builds off the growing popularity of real-world rewards. As I reported recently with Crowdtwist, consumers respond better to tangible rewards more than virtual badges and achievements. By effectively building what Kiip calls a reward network rather than another mobile ad network, it allows advertisers a new way to target and reach consumers in a way that feels more organic. And it encourages gamers to engage with a brand rather than grudgingly accept their banner ads. Founder and CEO Brian Wong said the idea for Kiip grew out of frustration with the current state of mobile advertising, which often felt like a miniature version of traditional display advertising and didn’t take into account the unique personal nature of mobile phones. He said mobile advertising has focused mostly on building impressions and buzz by focusing on ads that take up screen real estate. But he said it left open the opportunity exploit valuable moments as prime advertising real estate. “People take their phone out over short spurts for 5-10 moments of joy. Achievements may not occur, but when they do they’re meaningful and we want to be there at that time and give brands the ability to take that attention and provide value as well. That’s been the missing piece. It’s not just the attention exchange but the value exchange. Marketers wants to get attention but by doing that, you sometimes prompt negative effects. You want to get attention but also give a good first impression,” Wong said. Wong said the redemption rates in early usage have been more than 50 percent, meaning users are clicking on the rewards over half the time to redeem them. That’s much higher than traditional mobile ad click-through rates, though we’ll have to see if that holds up over time. That’s one of the questions I have. Will this be financially feasible for advertisers over long campaigns? A higher engagement rate would justify paying more for placement — Kiip will charge 25 cents to $3 per engagement — but the cost of the rewards could also add up. Also, the rewards will need to be well-selected for users, or it won’t seem that interesting to gamers. Wong said users can also gift a reward to others but if people get too many rewards from companies they don’t care for, the redemption rate will fall. Also, there is a danger in interrupting the flow of gamers, who may not take kindly to having notifications pop-up when all they want to do is keep playing. Overall, I think Kiip is a good idea whose time has come. Brands are now getting the tools to reach out to users in ways that actually matter to consumers. As long as companies get a little creative, there’s a lot of ways they can use real rewards to engage consumers. Bad domain name is bad! f they are planning for the later one they better be good at that because this is where I think is going to make the real difference. Is Kiip going to collaborate with other mobile gaming companies? Or are they going to make their own games for advertisers? If they are planning for the later one they better be good at that because this is where I think is going to make the real difference. It also depends on the kind of audience they are going to target whether they are casual mobile users Or gamers.